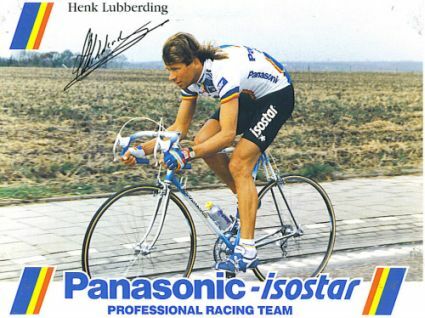 The first point on arm position I got from Henk Lubberding, a famous Dutch rider from the Ti-Raleigh/Panasonic period. I was a guest together with him once in “De Avondetappe”, a Dutch daily talkshow about the Tour de France. Great guy, great thinker on cycling (he has this clever technique he calls “Breaking with ABS on a bike”) and the topic of arm position also came up. Henk Lubberding in his Panasonic time. What he observes a lot (and so do I since he pointed it out) is that people ride with their arms stretched out. Especially in the drops, this happens a lot. The main reason is that people (including pros) put their handlebars too low because they think it looks pro and it will give them a lower position. Of course, this is not how it works, your body knows darn well how low it wants to sit, and the only thing you change when you lower your bars is that your arms stretch more, your back stays in more or less the same position. I’ll expand on that more in a later blog. The main problem Henk sees is that when your arms are fully stretched, the elbows are locked. This prevents you from making subtle steering movements, and as a results you’re more jerky and less precise, simply put you’re handling will start to look like a dump truck rather than a sports car. Bend the elbows (which often means “raise your bars”) and you’ll have better control over your bike. One note, another “advantage” of locking your elbows is that it allows you to support your body weight without any real muscular effort. When you bend your arms, some effort is required to prevent you from slamming your nose onto your bike’s stem (which is unpleasant, or so I’m told). This can be solved by either getting stronger arm muscles or by riding faster – the harder you push on the pedals, the less weight is supported by your arms. If you want to learn more, Henk gives cycling clinics. This entry was posted on	July 26, 2011 at 15:00	and is filed under bike equipment. Isn’t it also more aerodynamic for your forearms to be level with the ground? I’m not Aero expert, but I did read in Bicycling Magazine, that yes you are more aero with your arms parallel to the ground, I cannot explain why, nor can I confirm its validity, but I’ve heard the same thing. I’m sure Gerard will be able to explain why/how this is true. This might be the only thing I disagree with you on. Fit is different between each individual rider. I dropped my bars by roughly 30mm recently. This alleviated lower back pain, put some more weight on the front wheel and also allowed me to better take advantage of my long femurs and flexible hips with a longer crank arm. I’ve been faster on the climbs (not by a lot because I’m still a fatty) and I’ve helped create a more powerful all around pedal stroke. I will agree that for some, you are right…but not for everyone. What about shallow versus deeper drop, however? Seems to me shallow drop for a given drop position lowers your hoods, which requires straight arms on the hoods to get a relaxed upright posture. Too often I see the analysis flipped: that shallow drop raises the drops, but that’s only the case if you insist on the same “pro-look” stem clamp position. Andy Pruitt did my bike fit several years ago and the very first thing he did was raising my handlebars. Made a huge difference in control and my lower back pain disappeared. Also having your arms straight could cause wrist pain and hand numbness. I think you better be one seriously fast mo fo if you are concerned with the aero advantage of your arms as opposed to being able to precisely steer. I thought this sort of thing was actually a moot point in the professional peloton given the biomechanical, laser-informed fitting systems that the pros use these days? Aren’t professional riders’ setups determined by their own physiology and what the current sports science says is the “proper” fit? I read a very good article on bike positioning by a dutch guy (fogotten the name) many years ago. The article used Dietrich Thurau as an example. 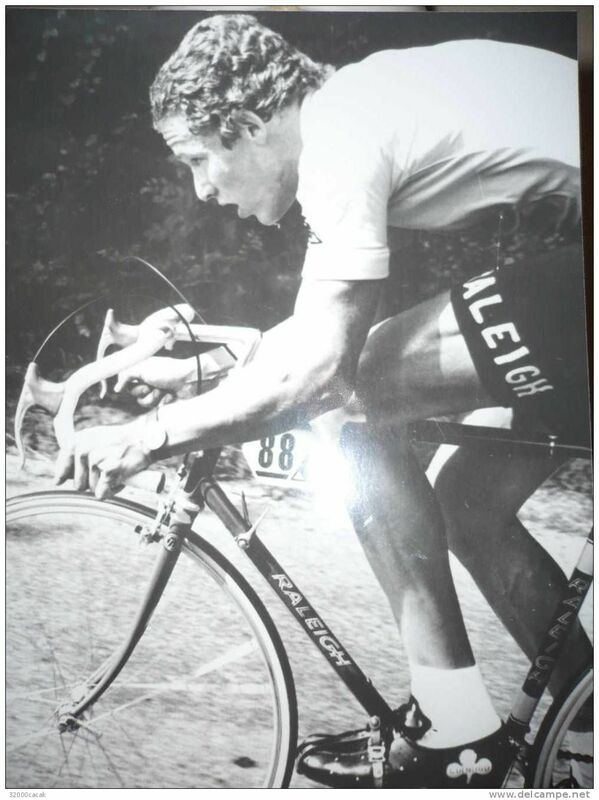 This was during the 80’s but Thurau had an excelent position on the bike, something that was replicated with most of the TI Raleigh riders at the time, including Henk. One of the points, was specifically wrist angle – a smooth line betwen elbow, forearm, wrist alignment ‘hooks of bars’. No upward tilt, just a smooth line. body position – with frame sizing – high brake levers, to alleviate the poor geometry setup – but hey looks ‘cool’ – Cipo used to sprint on the brake levers solely because he wanted that ‘look’ on the bike, but couldnt get a decent aero position unless he did that. I feel the frame geometry used in most carbon monocque type frames, with accountant inspired sized moulds, limiting the correct fitting – more bikeriders have a ‘sean kelly’ type position than ever these days. The so called ‘fit experts’ in the local store, with the new accreditation of ‘x’ brand fit qualifications, are handicapped by such generic average fit type frames to start with. Not everything can be solved by a stem that points this way, that length, or the tri seatposts that position ‘that far back, or ‘that far forward’. If you think I am barking up the wrong tree, then just take a look at the position of many pro riders using the Taiwan sourced popular mould models, or even watch the enthusiastic/hobby cyclists who are pedaling down the road near you today, and just look at their bike (as most bike riders do) then check the position. So what’s wrong with his position? Kelly had a long career with few injuries, won classics, grand tours, 7 Paris-Nices, time trials, everything except World Championship riding this way. He looks relaxed and in control. He was obviously an expert bike handler (Milan San Remo). Don’t results speak for themselves over some old-school aesthetic? If the back is relaxed, the position is adequately aerodynamic, the wrists are neutral, the elbows bent to absorb shock, then who cares about upper arm angle? Cadel Evans also rides with his arms low, yet without evident strain. I think it takes a very bold observer to claim he’d ride better differently. WRT arm angle and aerodynamics: don’t make the mistake of analyzing arms in isolation. They interact, aerodynamically, with the trailing torso and legs. Hardly excessive. Andy schleck has nearly 150mm! Webby, I can sleep easier knowing that I have at least that’s ONE thing in common with Sean Kelly! 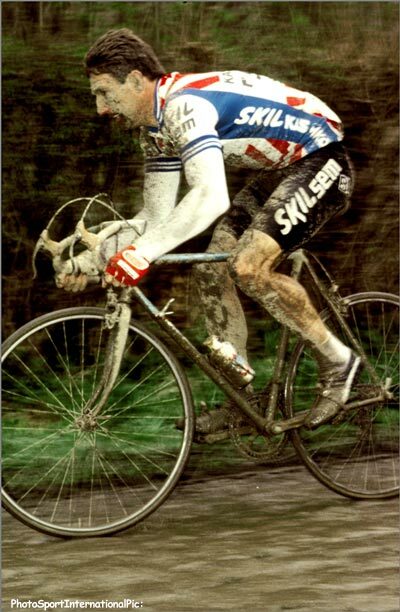 Sean Kelly on most of his road bikes was as ‘aero’ as a house brick. (on his time trial bikes, he only had an aero position, because they generally had 24′ front wheels. The fact he could induce wheel spin on a road bike whilst sitting in the saddle (try it peeps) is a testimony to his formidable strength, not his aerodynamics. He is without doubt a freak of nature, we don’t encounter the Sean Kelly’s often – Irrespective of whether you think I am right or wrong, (after all, its nothing more than experience & personal opinion) take a look at the riders in your local race, chaingang, beach road, or wherever you ride your bike with others. Take a long hard look at the positions and how they are balanced on the bike. It is not solely about ‘retro 70’s/80’s positions, but next time you see a rider check the position, and say what you see. Then start scribbling on a blog….. I see no evidence Kelly’s aerodynamics were poor.